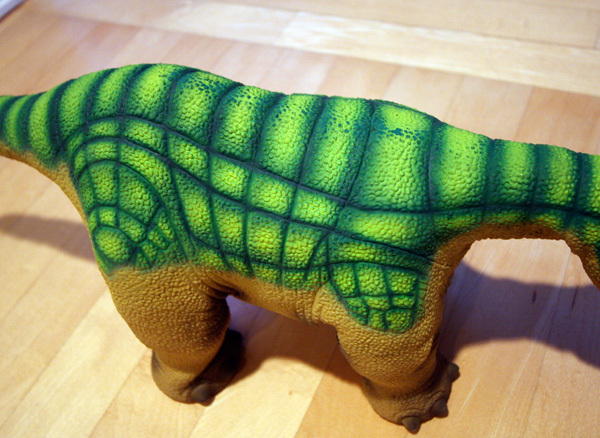 Pleo’s two week stint here at NOTCOT is up, so just packaged him back up to ship him home… its been an interesting experience having a baby robodino wandering around as i work. So what’s my final conclusion about the user experience of having him around? Honestly, its a really cool robot. An extremely unique experience for people of all ages, but i’m not sure that he has what it takes to hold your attention after he captures it with his inexplicably adorable sounds and behaviors that tug on your heartstrings. I found he’s most amusing when treated like a lap cat… he sits and whines and basically purrs and howls happily if you just pet him constantly, tickle his feet, etc. When left to his own devices he kept wandering *very very slowly* around the room, finding objects, rubbing up against them, eating the air, calling out for more attention or else falling asleep. The hardest part about any robotics right now, is throughout your playtime with him, it is impossible to forget that he’s a robot. As cute as he is batting his deep blue eyes at you, the sounds of the gears grind on constantly ~ although more quiet than most, its still hard to ignore. Also impressive is that he really is one robust little guy, he can probably survive some of the worst of kids and still keep doing his thing (with the exception of his skin perhaps which doesn’t seem to be on quite the same level as his robotics). I wasn’t able to yet play with programming my own behaviors and personalities for him, but when that happens i can certainly see the amount of time you’d spend futzing with him increase dramatically, but for now i did check out his *guard dog* mode which was pretty hilarious… pop the personality on an SD card and into his slot… and suddenly he barks at anything that moves! Here are pleo’s skin issues ~ really it feels a lot like some of those creepy halloween masks, so its not exactly the most fun to “pet”, but ironically he responds best when being pet… We weren’t rough with him, we just played with him for a few hours the first two days, and we started noticing that his skin was losing the top sprayed neon greenish color! 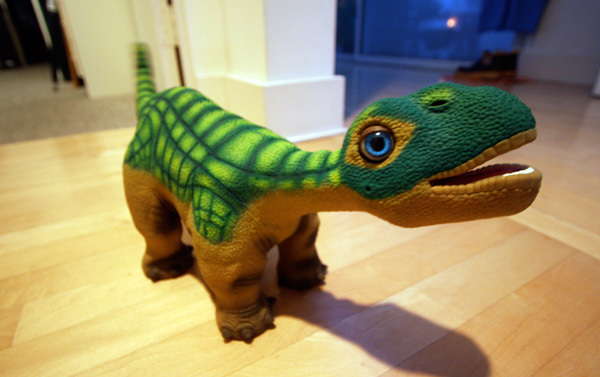 CNET has an awesome photo gallery of behind the scenes of Pleo from the Boise R&D Lab… here are some of my favorites! Doesn’t furry *snow* pleo look like a crazy mutant rabbit/kangaroo of sorts? Ohhh look at the fuzzy one.